Don’t want to use screws on your aluminum extrusions? Need to attach aluminum to itself or almost any other material? We now carry four different adhesives to meet most any need: adhesive tape, superglue, silicone and hybrid polymer. Download our Aluminum Adhesives catalogue to find out more. 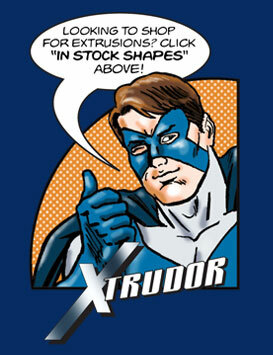 Wouldn't it be great if there really was a superhero that could swoop in and meet all of your aluminum extrusion needs? Well, think of Extrude-A-Trim as the next best thing. We have one of the largest inventories of specialty extruded aluminum profiles in North America, with millions of feet of in-stock extrusions. That means we can fulfill virtually any order on a moment’s notice. For vast selection, immediate delivery and customer service that is downright superhuman, we will always be there to SAVE THE DAY. Browse through our online catalogue of stock extruded aluminium shapes to get a quote on the ones you want.Simply visit the ‘IN STOCK SHAPES’ tab to choose your products, select a quantity and add to your cart…it’s that easy. One of our customer service representatives will respond quickly - just say “Xtrudor” sent you. We make it easy for you to order a sample of the aluminum angle, channel or any other extrusion you are considering. Make sure it’s right for your application and see the finish for yourself - we’re confident that when you see the quality of our product, you’ll be ready to place your full order. Want a hard copy of our aluminum extrusion profiles catalogue? Click the link below to download our complete catalogue including shipping and ordering details. You can also download individual catalogue section PDF’s.